How do you use a cookbook? I tend to use it as the starting point when making a recipe–the inspiration, the essence–and then adapt and adjust as needed. Some of my friends feel that a recipe describes what should be done to successfully make a dish, and won’t think about making changes on the fly. To get all the help even the best cookbook can give, one must know how to carry out the directions given. For instance, what is meant by a cupful or a spoonful. Modern cookbooks all use level measurements. This mean for dry materials, a spoonful or cupful over which the edge of a knife is passed; for wet materials, as much as the cup or spoon will hold. The manufacturers of kitchen supplies are at last realizing that women are serious in the demand for uniform-sized cups and spoons to use for measuring. If exactly the same materials are put together under exactly the same conditions the result will be the same–as it is in all other industries. Of course, changes can be made in certain things, and here she will show her judgment. Spices and flavorings can be substituted one for another, or left out altogether, or added to the recipe that lacks them. A trained laboratory worker with a fine eye and exact mind proves a capable cook, unless he or she is without a sense for flavoring. As the housekeepers grow more exact and accurate the cookbooks will improve to meet their demands, until cooking is a much more exact operation than is now possible. Probably the only recipe that I follow completely is on a cake,( cakes are not my strong point) the rest I use like you. Even with cakes I tend to tweak the process the little. Cake recipes often call for combining the dry ingredients separately and then adding to the sugar & butter/shortening mixture. I tend to just dump everything in together. If I’m trying a new recipe, I always follow it exactly. After that, I might modify it a bit. But like Deb, I always follow recipes for cakes exactly. I’ve seen what can happen when you don’t. Breads are the same. I think part of it is that I so rarely make a cake or bake breads, I don’t have the same sense of how the ingredients interact. My grandmother certainly did. I watched her make cakes and bread with nary a recipe in sight. I also am really careful to follow the recipe when making breads because I’m never quite sure how the yeast and rising process work – though I have an urge to experiment so that I would develop a better understanding of what happens if I adjust the times, knead it for a few minutes less, put the dough in the refrigerator overnight, etc. Good information. I usually do follow a recipe exactly, especially for baking. It definitely can be tricky to know how adjusting the recipe for a baked good might affect the outcome. I am a perfunctory baker. To me, baking is a mixture of chemistry and art. Somehow, when I get creative, the texture is off. Oddly enough, I find that people don’t eat cakes and cookies as much now. It seems to me that people like ice cream and candies. We rarely ate that when I was growing up. I guess tastes change. I’ve also noticed that pies seem to be more popular now than they were a few years ago. I started my adult life swearing I would never cook a meal. Now I make almost all my meals from scratch. I followed recipes exactly until I was more experienced. Now I changed almost every recipe to suit my needs and taste. Me too! The best compliment is when my kids come home and want to eat “clean” or all fresh ingredients. It’s wonderful that they appreciate your cooking. Wonderful post. Good info… But for me this post is something much more. Cookbooks hold a special place in my heart. My Mother would browse her cookbooks for hours. She had one old one that had lost it’s cover and was so worn that it was held together with a bit of luck and strip of fabric. I don’t know what became of it when she passed. I have a few cookbooks she gave me and many recipes she sent me through correspondence. The recipes are more than something to make, they’re precious memories. Thank you for this post, you’ve given my heart a nice warm smile. May Luck shine your way. 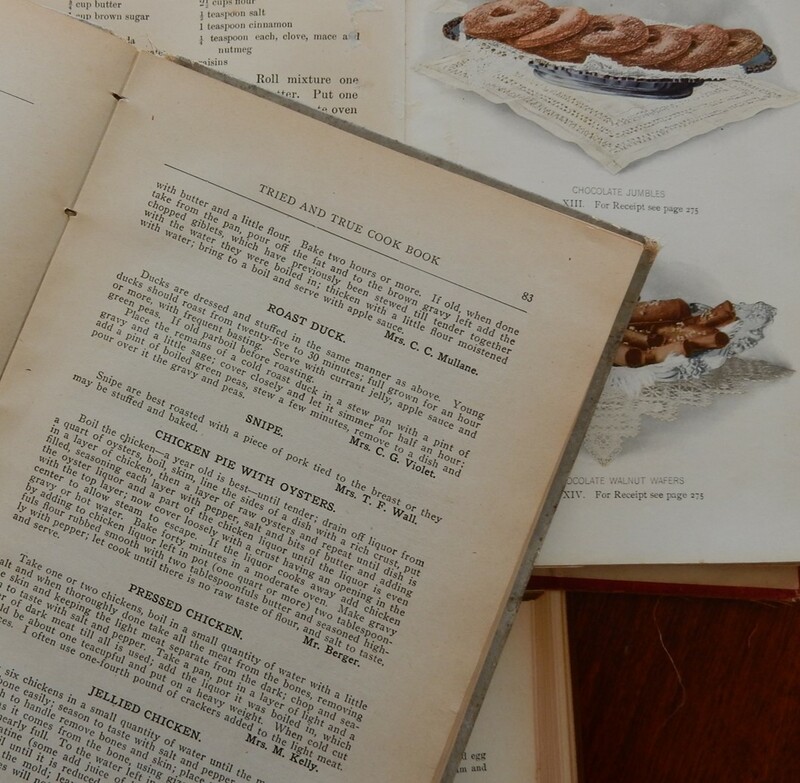 Old cookbooks are such special books filled with memories. The ones that are most worn (and the pages with the most stains) provide lots of hints regarding which recipes are the best. They tell us so much not only about the foods that were popular when they were written, but also about the people who used them. I hope that you had a wonderful St. Patrick’s day. May luck shine your way! Fascinating that exact measurements are such a relatively recent thing. However, I’m not good at ‘exact’. Recipe books are sources of inspiration, especially certain authors (Nigel Slater, Yotam Ottolenghi), and certain food blogs (take a bow, Mrs. Portly https://mrsportlyskitchen.wordpress.com/). After that, I tend to poke around in the kitchen cupboard and see what happens. It usually works…. I also tend to think that little adjustments and tweaks usually work. If I don’t have an ingredient, especially a “minor ingredient” it won’t stop me from trying a recipe. I also look at recipes through the lens of: Did a similar process work well in the past? How can I simplify this recipe? etc. The first time I use a casserole recipe, I follow it exactly. The next time, I tweak it. Using cookbooks for inspiration works for me. You are lucky to have a spouse who enjoys cooking. Beautiful Book: I cannot follow a recipe totally so I just throw this and that in there. It all works out well. I love the 100 years ago attitude and their cooking. A lot like me! Like many of you, the cook books come out to “refresh” my idea of a particular recipe. I enjoy comparing different cooks on the same recipe. Love seeing the older cook books! Thanks for another fun post, and Happy St. Patty’s Day! Love seeing the older cookbooks. I am like most of you, enjoy comparing different cooks/same recipe, before gathering ingredients. When it comes to recipes I like both old and new ways of compiling them. I like how easy it is to compare recipes on the web, and then pull pieces of several recipes together to make my own version of a food. Great thought and guide for we foodies who use cook books all of the time! When I came across the section on using cookbooks in the hundred-year-old book, I liked how it explicitly described a process for using cookbooks. I tend to take my cookbooks for granted, and until I read the old text hadn’t really thought about how I use them. You are absolutely right. Different families have different food preferences, and a good cook adapts recipes to make the dishes better suit their needs and preferences. My husband cooks like you do! He just uses a recipe as a starting point. I, on the other hand, am a slave to a recipe. I think it has everything to do with confidence! Sometimes I think that cooking can be viewed as either an art or a science – and that one’s perspective affects how closely a recipe is followed. There are few dishes where I follow the recipe exactly–mostly baking as others have said, or if something turned out really good the way I made it once and I want to recreate it. But generally I’ll start by opening up the index on all my cookbooks (and/or doing some Googling) and look for whatever dish I want to make, then compare the ingredients, methods, etc. and come up with something that sounds good and fits whatever I have in my pantry. It’s so interesting to me how older cookbooks seem to be written for people with a higher skill level, like in your photo where no recipe is longer than two paragraphs! I wish I could cook that way, just knowing how to do the different tasks without needing the step-by-step instruction. Like you, I tend to look at several recipes, and somehow merge the parts to creat my version of the dish. I’ve also noticed that old recipes seem to assume that cooks have a deep understanding of basic cooking concepts. Nice post sheryl, and I loved reading all the comments as well. Your post does make you stop and think about how we use cookbooks. I mostly use mine for inspiration. If I’m cooking for my family or friends, I don’t measure but if I’m developing a recipe for my blog I measure everything. I start out with the smallest of amounts, taste and if necessary, add ingredients until I think the taste is what most people would enjoy. I’m similar to you. I enjoy experimenting with recipes, but I carefully measure the ingredients when modernizing old recipes for A Hundred Years Ago so that others can successfully replicate them. I have several cookbooks that my young woman’s group at church published many years ago. Two of my favorite pages are the ones with my Mom’s Applesauce Cake and my Peanut Butter Cookie recipes. The stains just make them extra special. I so rarely use a cookbook. But the photo looks very similar to an older ‘Purity’ cookbook I have from my mother-in-law. Actually the cookbook with the picture was Lowney’s Cook Book.